Life is all about expectations. In most cases, so is movie-going. The Movie Minds’ expectations were set extremely low for Moneyball, which is sold as a true baseball fan’s dream yet a gripping overall story of triumph for those who’ve never watched a game. Frankly, I didn’t buy how a book written about the first GM to widely utilize the sabermetrics concept of statistical analysis in baseball, only to have his team fall short of ever really winning anything, could actually turn into a good movie. After serving up a big promise, it struck out. The one redeeming quality is that there are a few decent laughs which I found were a completely integral part of being able to get through this film. 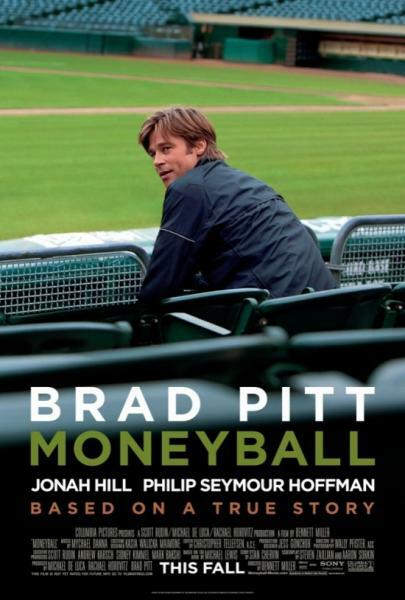 At its core Moneyball was supposed to be about baseball. So is it a good baseball movie? Nope. You’ll see more legit baseball action at your local little league field. It doesn’t help that the story centers on a guy who refuses to watch the games of the team he is responsible for. So instead of seeing the on-field action we’re treated to shots of Pitt in the gym working out and listening to the radio (how riveting) or staring off into the distance (how dreamy). Seriously though, the film could have cut 20 minutes out just by eliminating the scenes of Pitt staring longingly at nothing. We get it, apparently Billy Beane is a deep thinker (Ha!) but enough already. My guess is that the film will appeal to a very select group of viewers which are incidental to the marketing of the film: those who think Brad Pitt is a great actor, and the baseball fans who hate the Yankees and their big-market brethren. To be fair, Pitt actually puts together a decent performance although he plays the part a little too much like an ex-jock who was hit in the head too many times to be believable as a big league GM. As is the case with any Aaron Sorkin script, the story becomes more of a character study of Billy Beane and how his insecurities about the failure of his own playing days guide his feelings on the player evaluation process. Now who the hell knows other than Billy Beane himself if that was the real driving force behind it, but it’s a little too prominent as a Hollywood-ization for my tastes. As for the movie’s credentials as a good overall story without regard to its baseball merit, that’s yet another whiff. The story is completely one-sided, even for Michael Lewis’ (author of the book the film is based on) standards. It completely degrades the traditional scouting system and makes the scouts (some based on real people) look like buffoons and senile old men. In fact, after firing his director of scouting, Beane points to a kid in a small office and asks if he ever played before. When the kid responds with a “no”, Beane appoints him the new head of scouting. Not only is that comical to believe that’s how it actually happened, it perpetuates the idea that scouting is useless. The film also fails to even acknowledge, let alone expose, the fundamental flaws of the reality of the effect of the Moneyball system. It’s not all that hard to put up consistent wins with a very low payroll when you have a starting pitching trio of Barry Zito, Mark Mulder, and Tim Hudson, all in their prime. While watching the movie you would have never known who their pitchers were because apparently signing Scott Hatteberg who walked a lot was the real key to their success. The biggest flaw of all, however, points to something Beane himself has been noted to say, which is that the system doesn’t work in the postseason. It’s too small a sample size. And according to him throughout the movie, the only way you win is if you win the last game of the season. So in reality, what does it truly accomplish besides fielding a competitive team on the cheap? (Side note: the A’s were one of the dynasty teams of the late 80′s & early 90′s). This gets to my issue with the final shot before the film’s credits which state that the Red Sox go on to win the World Series while largely employing Beane’s philosophy. The trouble with that logic is that Boston has the same luxury as the other big-market teams to be able to employ the statistical analysis yet still spend whatever they want to go and get those players. Beane and the A’s had to find “value” players that were cheap enough to afford for the production they provided. Boston took Johnny Damon from the A’s as a result of being able to pay him more, yet the final shot of the film wants us to believe the Sox finally won a World Series solely because of employing advanced statistical analysis? There are so many historical flaws in the film that they’re not all worth mentioning and most likely, unless you’re a diehard A’s fan, you won’t notice them either. Even though the film took great strides keeping the names of the players, managers, and front office personnel accurate, there was one blatantly glaring omission. Peter Brand, Jonah Hill’s character, was in fact supposed to be Paul DePodesta, the real-life former assistant to Beane and future GM (flameout) of the Dodgers. Supposedly DePodesta removed his name (and likeness) from the movie after being displeased with how he was portrayed as purely a number-crunching stat geek. While Hill clearly looks the part of someone afraid to play in the same room as the grizzly old scouts, DePodesta was in fact a two-sport athlete at Harvard who knew enough baseball to go toe to toe with them. I think it’s in stark contrast to film since it looks as if Beane almost never heard of the sabermetrics concept until Hill’s mousy character explains it to him, which we know is not the case. The film’s pace was about the same as a typical Yankees-Red Sox primetime matchup in that it feels like you’re watching an all-day cricket match. It begins with the end of the 2001 season in which the A’s lost to the Yankees and then lost their top 3 players to free agency because they couldn’t afford to keep them. It then labors through the offseason and decision by Beane to bring in the new kid, Peter Brand (aka DePodesta), and get everyone onboard with the new direction of player evaluation. It then drags through the start of the season where the team falters and Beane fights with the manager, Art Howe, to actually employ the guys they brought in who fit with the system. The worst part about this was that Philip Seymour Hoffman plays Howe in one of the most one-dimensional roles ever created. You’ve got one of the best living actors in a one-note role where he plays a stodgy curmudgeon whose sole purpose in the film is to make the genius of Billy Beane believable? What a waste of great talent. Not to mention that Art Howe can NOT be pleased after watching the movie. Then the film rushes through the record-setting 20-consecutive game streak the A’s put together, and ends abruptly with another playoffs flameout. Interspersed in there are some diatribes about the value of taking walks, made to look like Beane actually was the one coaching the team, and a weak plot kink involving Beane’s possibility of getting fired and having to move away from his daughter. Other notable snubs include Jeremy Giambi, who is portrayed as a strip-club and casino loving sulker who could care less about winning, and the owner of the A’s (possibly Steve Schott) who also could also care less about winning or investing in the franchise. (maybe the latter is true). Either way, they do not have favorable portrayals of the film and can’t be too excited to run and see it. Unfortunately the rest of us shouldn’t be too excited to run and see it either, only we didn’t get lambasted onscreen. Interesting Cameo Appearance: Chris Pratt (aka Andy, the dimwitted and equally charming lug from NBC’s Parks & Recreation) as Scott Hatteberg, an over-looked broken-down player that Billy Beane’s Moneyball philosophy centers around. Peter Brand: Your goal shouldn’t be to buy players. Your goal should be to buy wins. In order buy wins, you need to buys runs. Billy Beane: There are rich teams, and there are poor teams. Then there’s 50 feet of crap. And then there’s us. David Justice: What’s your biggest fear? Billy Beane: We are card counters at the blackjack table. And we’re gonna turn the odds on the casino. Billy Beane: If we pull this off, we change the game. We change the game for good. Billy Beane: We want you at first base. Scott Hatteberg: I’ve only ever played catcher. I am only going to watch this movie on DVD because I watch every movie that has to do with baseball. We need a Bull Durham type movie about college baseball. Beg to differ; I liked the movie “Money Ball”.